It was a bit sad realizing that today was the last day here. We tried the breakfast buffet in the hotel, which was okay but nothing special. The wait staff all seemed like the customers were a bother and that they had better things to do than to be there. After checking out, we left our bags with the desk and walked across the green to the Country Music Hall of Fame and Museum. We opted for the audio tour and it was interesting. I personally thought that there wasn't enough material on the last 10-20 years of the industry. They might get more visitors if there were because there sure weren't many people there. 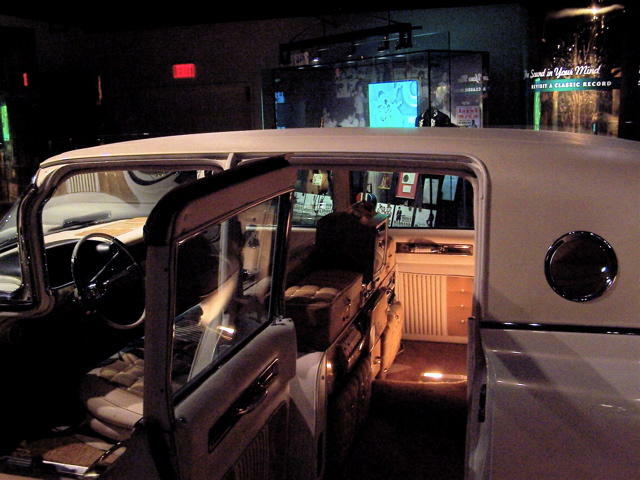 We saw Elvis' gold Cadillac and other memorabilia. There were a lot of Nudie suits throughout the tour. By the time we were done, it took a few hours, a pretty bad thunderstorm had moved in and it was coming down cats and dogs. We waited it out and spent some money in the gift shop. After 15 minutes or so it had calmed down enough to make a run back to the hotel. We decided to risk the rain and walk Broadway again, stopping for some gifts along the way. The tourist shops seem to all have the same merchandise so it started to look alike from one to the next. We found ourselves back at The Stage on Broadway with cold beer in hand. The solo artist from Friday was back but now he had a band. Next, we went into Tootsies to get a t-shirt then on to Legends. There was a band and blonde female singer that was just not impressive in any way at all. Not terrible, but just not all that good either. Even another cold beer didn't help make it any better. Given the time and the weather, we left to head back and get to the airport early. We did get a little wet on the way. Then, to our surprise, we had the same cab driver we had on Saturday going to Opryland! Moving through the airport was easy and I am actually writing this from the Stadium Club in Terminal C!